I like pizza as much as the next person, though I rarely eat it because of the refined flour that goes into the crust. 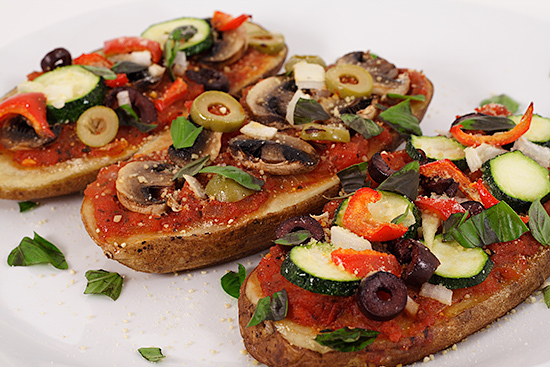 Then a couple of weeks ago, Saje, a member of the FatFree Vegan Discussion Board, posted a link to a recipe I just had to try: Pizza Potatoes, a terrific idea from the folks at the All-Creatures website. Let me just say, I will never go pizzaless again! The idea is deceptively simple: You take a large baking potato, slice it lengthwise into three pieces, bake the slices, put toppings on them, and cook them again. 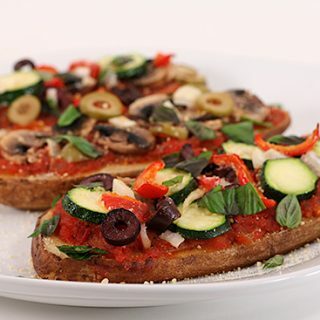 You wouldn’t think that tomato sauce and vegetable toppings would taste so great on a potato, but just as there is some kind of transformation that goes on when those ingredients sit atop a traditional crust, the combination is magic. Though the idea is simple, the original recipe wasn’t simple or fast. My version cuts out one of the steps–making a “cheese” sauce. I haven’t had cheese on pizza for years, so I figured I wouldn’t miss it, and I was right. Those of you who insist on cheesy pizza may want to follow the original recipe or sprinkle a little vegan cheese on top. A light dusting of almond parmesan was all I needed to make my potato pizzas perfect. Slices of baked potato stand in for pizza crust in this unrefined (in a good way) recipe. Start with potatoes that are at least 1-1/2 inches thick in the middle. Scrub each potato well. Cut into three slices, making the outer two a little wider than the middle one. Take the two outer slices and trim a little bit off the bottom (rounded side) in order to make them lie flat. While the potatoes are cooking, make the pizza sauce: Sauté the onion in a non-stick saucepan until it becomes translucent. Add the garlic and sauté one minute more. Pour about 1/3 of the can of tomatoes into the saucepan. Using a blender or hand blender, puree the remaining tomatoes and add them to the pan. (I do this right in the can with a hand blender.) Add the remaining sauce ingredients, and simmer on low until the potatoes are ready. When the potatoes are done, take them out of the oven, spread each one with sauce, and top with your choice of toppings. (I made one with zucchini-calamata olives-red bell pepper, another with mushrooms-green olives-onions, and another with everything.) Put them back into the oven and bake for 15-20 more minutes, until the toppings are done to your taste. Remove from the oven and sprinkle with lots of fresh basil and vegan parmesan, if desired. Careful, they will be hot! But once they’re cooled, you can pick them up like regular pizza. Get as creative as you like with the toppings. Enjoy! Ooo I'm making these next week! I was thinking of putting zucchini and eggplant on these but I was wondering if I needed to precook those before they went into the oven for 15-20 min at the end or if they get cooked during that process? I made these tonight for my family and they loved them! I put sauteed green and red peppers, purple onions, zucchini, an basil on them. My 6 year old said they were a definite "do-over". We are not vegans, I just have a serious dairy allergy, so I did put pepperoni on my kids (though you can get meatless pepperoni). Thanks for sharing this recipe and I look forward to trying more! I know your comment is outdated, but here is a recipe calculator for nutrition info that you can use on almost anything. Just input ingredients and number of servings, and there you have it! Yum! My dh has recently become allergic to gluten, and whilst I make a yummy pizza, nothing for him! so this could be a good alternative! Thanks. I discovered your site and I must say I love it. I have a 1.5 year old allergic to milk, soy, egg, peanut and a mild allergy to chickpea. I wrack my brains to come up with stuff to do for him and here I have sooo many ieads, which i can use and make it to his liking. Okay, this is lunch tomorrow! slurp! I’ve been looking for just this kind of creative recipe, since I have two ten pound bags of potatoes to use up. this looks WONDERFUL! I wonder how much “healthier” a starchy white potato is than a refined flour crust. I’m not vegan but my mom doesn’t like to eat meat and this recipe is very interesting. From a carbs-calories-fat perspective is the potato the better way to go? Anyway, I’ll definitely be trying it out! I guess I’ll respond to this like it’s 2010…. A potato is a whole plant food comprised mostly of water. A refined flour crust has a much higher calorie density than a potato because the grain has been ground up to make the flour. 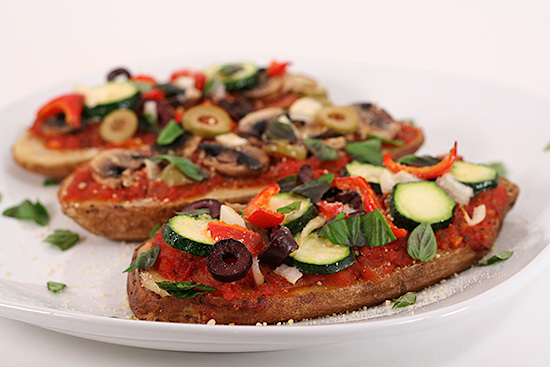 You could stuff yourself on potato pizza before you overate on calories, even with these toppings. Not so with a refined flour crust. Made these tonight. I think the potatoes I got were too big, because my husband and I were only able to eat 2 each, rather than 3. My 13 month old ate one, she seemed to enjoy it. Very interesting and looking forward to making them again and experimenting with different toppings. Tonight’s had green bell pepper, mushroom, red onion and black olives (except on mine, I don’t like olives). I also sprinkled garlic powder on top of the sauce before placing the other toppings. Thanks for the idea….as a non-vegan, i changed it up a bit but still delicious. I had been playing with new food ideas for months and when i came across this i knew right away i had to try this. I cook my sauce first, and then put it on the raw potatoes, then add my cheese, and toppings…and then i bake. And if you really wanna go the extra mile, adding a small but of garlic butter brings out all that flavor. I am a Potato lover 🙂 and I can eat anything made out of potatoes. Your recipe looks awesome and it’s very apitizing. I will sure try this recipe this weekend and let you know….your other recipes are also lovely….I like the way you use healthy ingredients…. Making these for dinner tonight and see excited to see how they turn out! I am a SERIOUS potato-lover. I eat potatoes every single day, if not twice a day. They are by far my favorite food. That being said, I’ve never tried anything like this. Looks delicious! As for the nutritional value of using a potato in place of a crust–of COURSE it’s going to be healthier. Potatoes are not only low in calories, but they are FULL of vitamins and minerals that even fortified grains don’t have. Potatoes have twice as much potassium as a banana, as well as half of your vitamin C intake. They are a whole food, and as far as I’m concerned, that’s always a better option than processed grains. Anyway, thanks for the recipe! I will be making them tomorrow. Just put these in the oven with a vegan pesto base instead of Tom sauce… (tom’s do bad things to me!) Can’t wait! topped them with black olive, red onion, pineapple, sauteed spinach and will probably sprinkle with spring onions, YUM! I’ve seen a recipe for spaghetti/pizza sauce made from carrots and beets that does not have any tomatoes. You just take one 15 oz. can of carrots and one 15 oz. can of beets, blend them up in your blender, and add whatever seasonings you would normally use. Haven’t tried it myself, but it’s worth a try! If you try it, please post how you liked it! Oh my goodness, these look absolutely amazing! I bet the zucchini and olives are a great pair…I would probably put loads of onion and peppers. I can’t wait to try these and show my best friend that being vegetarian/vegan can be awesome. Thanks for giving me an easy, delicious alternative to the traditional dough pizza crust that the rest of my family likes. I never would have thought to use the toaster oven – I can make theirs in the regular oven and still make mine at the same time. Thanks again! So very excited to try this recipe tonight. I have a really strong craving for pizza and I just found this recipe. About all I will need to add is pineapple and jalapeno pepper. Thank you. On my way to Tokyo today working as flight attendant, I will be prepping an E2 Portobello Mushroom sandwich. If only we offered our passengers these kind of meals! Engine 2 needs an airline alliance. I am sharing your message & recipes with my flying partners. I made these last night for a friend. They were a HUGE hit!!! I was looking for something quick to make for lunch that would be McDougall MWL compliant. These were perfect! I already had cooked potato in the fridge. I used Muir Glen sauce and topped with mushroom, kale and spinach. Should have tossed some onion on too, but otherwise YUM! I look forward to experimenting with this one. I was so happy to see your post of the Vegan Cabbage rolls. As it so happens I broke down and made ground meat/rice filled cabbage rolls in sweet and sour tomato sause after buying some in a Kosher super market. They tasted just like my late mother used to make so I HAD to make my own. Of course I couldn’t find anything Vegan, so I followed a Kosher recipe on YouTube. I used raw rice, big mistake, cause it sucked up all the juice. I also used the “putting the cabbage in the freezer” method. That works pretty well. But to make this dish, it is an all day affair for me. I froze most of it for individual portions for meals throughout the winter as I live alone and hate to cook every night. So when I get up enough courage I’m definately making your vegan version!!! I hope they freeze well. I’m very big on doing that. Now my MAIN question is: When I was on the Nutrisystem diet in 1996 and lost 53lbs. I used to eat a wonderful muffins every morning for breafast with my coffee. Now I am a person who cannot eat a “normal” breafast in the am as my stomach is uneasy in the AM. I have been this way since childhood. But I WAS able to have these 2 little muffins. They were very nutritious bran type muffins. I was wondering if you had a recipe, or could direct me to a recipe for a nutrient dense muffin. My nephew brought me a hugh bag of apples and potatoes yesterday. So anything that included them would be wonderful. I bet you could pre-bake the potato slices and freeze, to save time. Then just take out when ready to top and eat and bake for the last portion of the recipe. I made these for dinner tonight. Oh, soooo good. Very filling. I baked mine a little longer as I wanted my potatoes to be a little on the crunchy side, so I would suggest baking potatoes for almost an hour till crispy, (I also got 4 slices out of each potato. ) My meat eating hubby got pepperoni and cheese on his, (he thought they were the best thing he had had in a long time I topped mine with pizza sauce, and precooked mushrooms, red peppers, and onions, with a little garlic. We were both happy! Next time, I will probably just slice a medium potato in half, dig out some of the potato after an hour, then fill with pizza toppings. I think the crunchy potato skin adds a good flavor. Hi Susan! I jut got a 5lb bag of potatoes on sale and have not come up with a good way to use them all. This is a great, easy, and veggie friendly idea. Thanks! I want to try making these with tiny potatoes for appetizers. That means I’ll only be able to get one olive or one piece of pepper on each one :p but I’m sure they’d be a huge hit (and filling!). This sounds really good! I think I will have to try it. Thanks for the recipe!